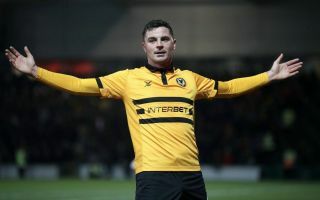 Newport County striker Padraig Amond scored an unbelievable goal to secure a huge cup upset against Middlesbrough on Tuesday night. The Irishman smashed home an outrageous half-volley on the edge of the box after a corner was swung in from the right-hand side after 67 minutes, which turned out to be the final goal in a superb 2-0 FA Cup win. The two sides were engaged in a replay at Rodney Parade this evening after the reverse fixture ended 1-1 on January 26 at the Riverside Stadium and the League Two side have claimed a huge scalp to book their spot in the fifth round. Newport produced a superb display against their Championship opponents on the night, outplaying them for large periods and when Robbie Willmott opened the scoring just after half-time, it was a fair reward for their efforts. NEWPORT. COUNTY. IN. DREAMLAND! ? 2-0 to the League Two side, and just LOOK at that finish! ? The English winger sprinted the length of the field before firing into the top corner and he could have been forgiven for thinking he’d grabbed all the headlines with his special goal, but Amond stole the limelight with his later strike. Check out Amond’s brilliant volley below, via Twitter. FA Cup Live Stream – Watch Manchester Utd take on Brighton Live Streaming from Old Trafford – Can The Red Devils down the Seagulls?